Islam Awareness Week sponsored by Bucks M. S. A. 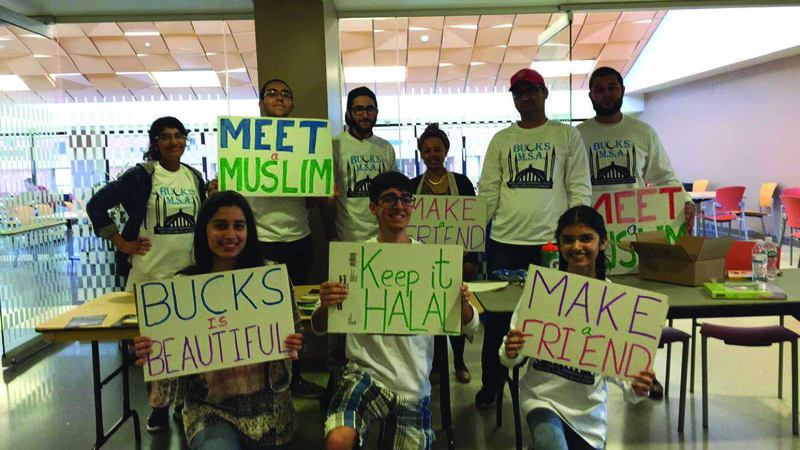 In recent weeks Bucks was host to, Islam Awareness Week, a weeklong event dedicated to informing the faculty and student body about the Islamic faith. Why the need for such a week? The answer to that is an unfortunate one; many people still have common misconceptions about Muslims and the Islamic faith. Especially in light of the recent terroristic actions performed by the Islamic State of Iraq and Syria, more commonly known as I.S.I.S. Conditions in Iraq and Syria had become so bad that masses of refugees were flooding the U.S. This caused many states to shut down their boarders and their surrounding coasts. Tempers flared in the U.S. because innocent people were seeking help. 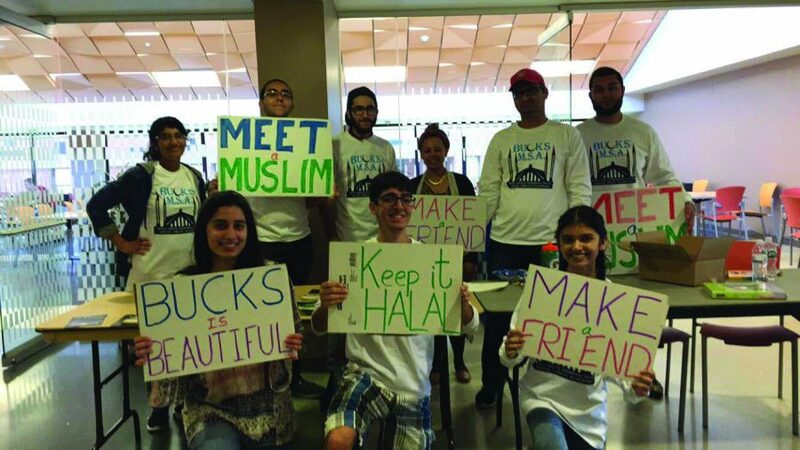 The Muslim Students Association (MSA) at Bucks wanted to use their resources to educate the populous of Bucks into understanding where and what these people were coming from. Razin Karu, Co-Founder of the Bucks MSA, and the members of the organization brought this week of events to life in just the club’s second semester in existence. Karu and his club helped organize the events because he has been the subject of prejudice because of his Islamic Faith. “There have been sporadic instances on hearing bigoted comments and racial slurs. But that’s fine. People do it because they don’t know much about Muslim people. And that’s why we had this cool event. IAW (Islam Awareness Week) is to debunk myths and spread the truth,” Karu explained. That has been the main focus of the club; informing people so their misconceptions about the Islamic faith can cease. Meet a Muslim day was held on April 18. Students could interact with Muslim students and ask them why they choose their Islamic faith. “Out of Cordoba” screening was on April 19, where students and staff could watch a film about the coexistence of Christians, Jewish, and Muslims in Islamic Spain. The Islamic Cultural Lounge, which took place on April 20, exhibited posters, charts, and pictures of famous Muslims. Students could also try some traditional Muslim cuisine and get a henna tattoo. Prophets Before Muhammed was an information session, held on April 21, where a scholar, Shaykh Mateen Kahn, came to teach about prophets Adam, Noah, Moses, and Abraham. Lastly, Jummah on the Greens took place on April 22. Students were encouraged to participate or watch a congregational prayer with a visiting scholar, Muffi Niaz Hannan. One of the most successful events held was the “Out of Cordoba” screening. The film explores the relationship between Jews and Muslims from the medieval period to the present. It brings to light the importance of two crucial medieval Muslim Spain thinkers: the Jewish Maimonides and Averroes, a Muslim. It urges everyone to harken back to the ideals of acceptance and peace by the two thinkers to attempt to dispel the idea of a – what many have deemed inevitable – clash of civilizations between the Muslim world and the West. The documentary also highlights Bender’s own experience in countries including Spain, France, and Israel after the 9/11 attacks in an attempt to find people dedicated to the tolerance and acceptance of Jews, Muslims, and Christians through their religion. The 9/11 attacks personally affected Bender, who is from New York City, but now works in Philadelphia. He witnessed the World Trade Center disaster, and for the last 15 years, along with the rest of the world, has witnessed a changing of the guard in terms of attitudes toward the Muslim community. “9/11 has changed the landscape. I see day to day everywhere that the Muslim community is nervous to say the least,” Bender said. “[Muslims] are fired from their jobs for praying, and are finding themselves on airport watch lists because their name is Muhammed,” he added. Bender talked about the sudden shift toward a negative stigma for Islam. “20 to 30 years ago, the Muslim community was totally off the radar of public consciousness. People didn’t talk about it. Then 9/11 happened. Then the wars happened. Then ISIS,” he said. The amount of people who have become vocal against the Muslim community has grown. The film itself has reached a large, and quite diverse, audience since being released in 2009. “The film got accepted into about 10 festivals. It was shown on Spanish national TV. It was bought by Al-Jazeera in Qatar. They did an Arabic version and showed it around the Middle East,” said Bender. Aside from directing and producing “Out of Cordoba,” Jacob Bender is the Executive Director of the Philadelphia branch’s Council on American-Islamic Relations (CAIR). “[CAIR] is the largest and most important Muslim civil rights group in the country,” Bender said. “I am the first non-Muslim head of a local Muslim group,” he added. “The Philadelphia Muslim community is 200,000 people, mostly African-American third and fourth generation,” Bender said. While he has received some criticism from the Jewish community since the release of “Out of Cordoba,” Bender mentions that the reaction has been largely positive. “I have yet to hear one negative remark from a Muslim,” Bender said. The film’s message of acceptance, of people of all faiths, is more important today than it has ever been. Bender’s goal to bring together Muslims, Christians, and Jews is not one that is going to come to fruition easily, but his work with CAIR and the documentary will continue to better educate the American people.